A former Donald Trump campaign bus remodeled into anti-Trump automotive artwork will be displayed in Wynwood for Miami Art Week after another art fair pulled the plug. 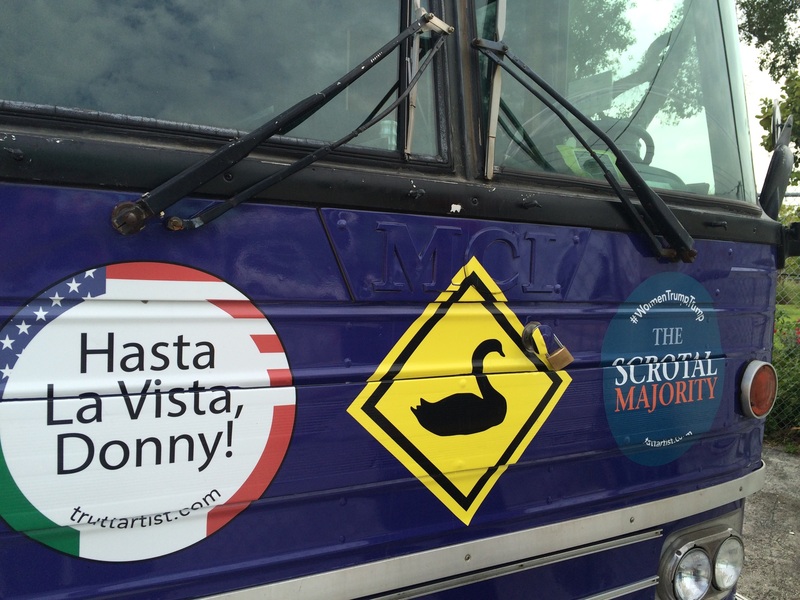 Out-of-town artists Mary Mihelic and David Gleeson were supposed to display the bus — which the Trump campaign used briefly during the run-up to Iowa’s Republican primary — at Red Dot art fair in Miami. But days after Trump’s upset victory, fair organizers emailed to say the protest bus was no longer welcome. A chance for new filmmakers to create the official music videos for an Elton John classic. Syrian artist Abdalla Al Omari left his home country in 2012, the year that the battle between rebels and government forces reached the streets of Damascus and Aleppo. Displaced and angry, Omari sought asylum in Brussels in 2014. 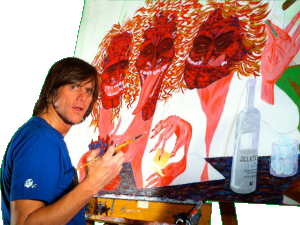 That's when he started a series of paintings portraying the world's most powerful and influential figures as if they were in the same position he had found himself in. Omari portrayed the likes of Russian President Vladimir Putin, North Korean leader Kim Jong Un and former president Barack Obama as dirty, disheveled and starving refugees lining up for food. His exhibit, “The Vulnerability Series,” which features at least a dozen paintings of world leaders, is on display until July 6 at the Ayyam Gallery in Dubai. 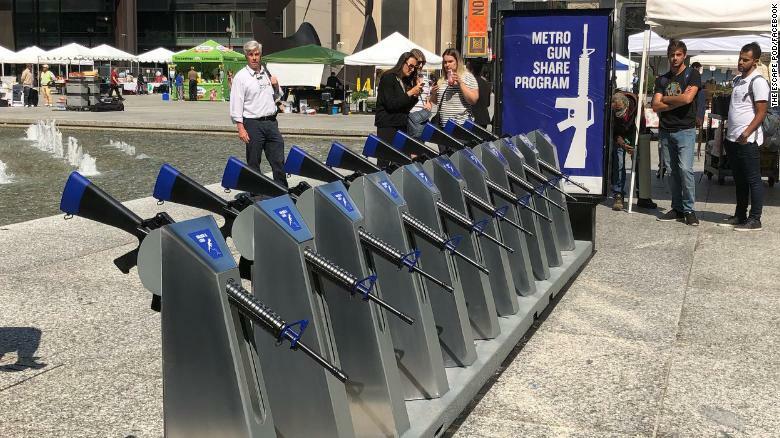 It's like a bike-sharing station, but with what appear to be AR-15 rifles. I found tn mannequins too strange for me. 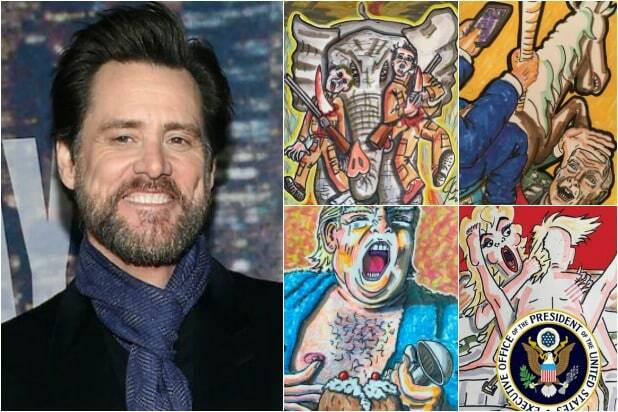 Seems like Jim Carrey has gotten himself into painting. I'm not an art teacher or critic, so I can't really comment on his talent or ability. The work seems amateurish, but expressive. Obviously, his thematic foci have gotten some attention. I would say there is a bit of Hieronymus Bosch in the style. Like all proper artists, he now has a beard. 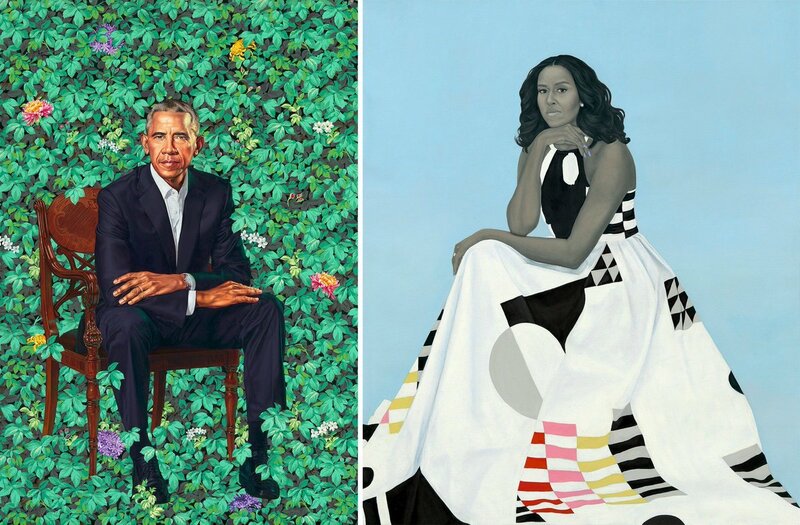 I would say he's a more expressive painter than dubbya bush. That's damning with faint praise, though. He's onto something regarding post-post-modern politics, but I'm not sure what. Also, I doubt that drumpf ever had chest hair. Critically, the best I can say is that it's very L.A.. Cartoons for a cartoonish city. Unfortunately that means that about 20 people I can think of are doing it better. He'll outsell them all combined, though, because he's a celeb. There are people who pay collector's prices for celebrity art just because it's by celebrities. There's some great polemic art being made in L.A.. 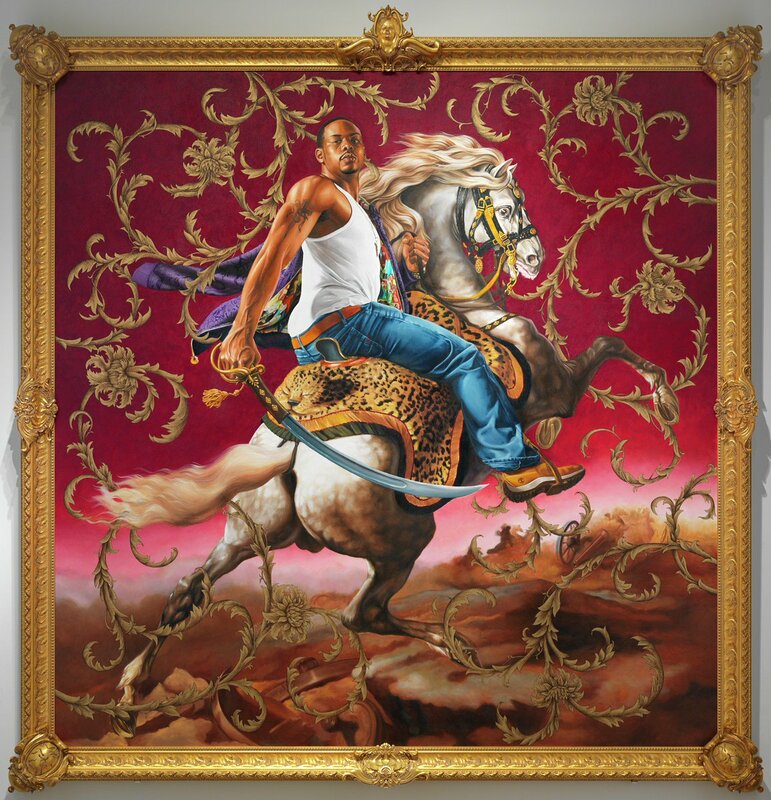 I wish I could find a reproduction of the Big Gulp painting made during the Iraq war, but since a great many other artists have used that title, it's buried under other people's stuff in searches. I've seen a lot of pictures of the Gun Sharing Station. I consider that to be a work of genius. Street art is some of the best stuff going. Well, there is art and then there is artifacts. Does his painting have other valve, IDK? He does have a gift for comedy. There may be a place for it. I say too, that seeing a painting right before your eyes is a completely different experience than a picture of a painting. Last edited by TheFox on Thu May 31, 2018 4:22 pm, edited 1 time in total. Criticism is not my gig. My tastes are solely mine. But I do like to read and hear criticism. I found that one of my favorite programs is back, Jennifer Stone, A Stone's Throw. If you haven't heard it, look it up on KPFA. She is an excellent cultural critic, with a keen eye and a pure heart. I don't know how old she is, but she is old, and that only adds weight to what she has to say. Her sense of humor is contagious. I haven't heard her talk about painting, but mostly books, movies, and television. Last program, she talked about the Royal Wedding presentation. It was excellent. Oliver is good. He also started the Change the Ref activist group along with his wife.